This post is for you, fellow bloggers or bloggers-to-be. And we need to learn how to deal with it if we want to succeed. Profound? Probably not. Sorry. But, I’ll proceed anyway. When I first started blogging four and a half years ago, it felt like a pretty small community where you just might actually get to know everyone in your niche. Of course, it wasn’t THAT small, but it certainly was MUCH smaller than it is now. And I’m sure the year or two before I started blogging, the world felt even smaller. A few years back, you would write from your heart and if you were decent at blogging you could still stand out in a sea of blogs. It was still really hard work, but if you were diligent, persistent and better than average at providing good content and building a community through blog comments, you probably could survive and succeed as a blogger. Things seem a wee bit different now. It feels like everyone is getting in the game, which is great! But today, it seems blogging isn’t only about blogging well. It is evolving to be about the numbers you have all around the internet and how clever or persistent you are at getting those big numbers to drive big traffic back to your blog. These days bloggers concern themselves with things we never even knew we would need to think about back in the day. Like, how many pins did your project get? And how many will you get if you are just a little bit more fancy with Photoshop or do a few more pinnable posts? How can you get the most Facebook likes or Twitter followers? Did you get any RT’s on twitter? How many people follow your images on Instagram or your pins on Pinterest? Do you have Klout and is it rising or falling? Should you go to a blogging conference? Which ones should we go to? Who got asked to speak where? Should we join a promo group to promote each other to the top of the game? What kind of camera do all the “successful bloggers” use? It is kind of complicated (and sometimes expensive) to be considered a great blogger and online influencer. In fact, just thinking about it, my head *might* implode from the crazy endlessness of it all. When is “enough” really “enough?” Don’t get me wrong, I adore blogging. I still LOVE LOVE LOVE it. I’m not against competition or numbers or the growth of the internet, those are good things. But let’s just say I don’t really like to be pressured or even tempted to do more. So how does one go about setting goals for blogging success these days? There is power and reward in numbers and influence. But, should those markers of success be our real goal? While I think having specific numerical goals is helpful and necessary at times, when I’m setting blogging goals I would rather think about what it is I’m really looking for. The underlying building blocks of a well-lived life. Things like more contentment at home. More peace. More joy. More meaning. Health. More family time. All that real LIFE stuff. It is so easy to lose yourself and lose sight of your real goals because you are being pulled every which way online. So, how do you focus your online energy and what is ENOUGH when it comes to setting blogging goals? Do we have to choose between a successful LIFE and a successful BLOG? I think the answer for me lies somewhere between taking deliberate action to grow my blog business (which is important to me right now) and knowing when to say “enough” (which is VITAL for my overall long term health and success in life). I don’t always get that balance right, but I know it means I cannot do it all and do it all “well.” I have to make choices every day. It comes down to being intentional. It actually always has. The times might change but the goals really don’t. Even “back in the day” being intentional was the key to feeling successful. Two extra hours on the internet each day or two more blog conferences across the country or two more DIY projects this month might bring me more followers, pins, likes, or more influence, but I might lose myself and distance my family in the process. Being intentional about our real underlying goals at home and in life first, before we set our blogging goals, might keep us balanced enough as people to stay in the blogging game for the long haul. Four and a half years later, I’m still here so I haven’t gone too crazy yet! By first looking at the end result we want to achieve in life, it is easier to make choices about where to spend our time now. Today. This minute. Otherwise, we might just head toward burn out or imploding heads. And no one wants that. So bloggers, let’s talk about blogging with intention! How do we pace ourselves? If you are a blogger, would you share in the comments how long have you been blogging? What is your experience with the growing and changing nature of blogging? What advice or questions do you have for other bloggers, old-times or newbies? What are the things that drive you crazy about trying to grow your blog while maintaining your sanity? What are some ways you are intentional, set goals, and say “enough” when it comes to time spent on blogging and related blogging activities? I have been blessed to have traveled to some lovely and memorable places in my life. I think traveling has stretched and shaped my sense of what is beautiful in this world, I am so grateful for the opportunities I have had. I am definitely inspired by travel! Some of the places I’ve been are far away lands like Italy, Germany, France, Budapest and England, sometimes the adventure has been a little closer like the East coast or over to Canada or Hawaii. Most often I go to places closer to home in the Northwest like the quaint neighborhoods of Portland and Seattle or my beloved Cannon Beach. But no matter where I’ve been, I try to collect sketches, drawings or paintings from my travels to not only decorate my home but to remind me of great memories and beautiful places. Sometimes I choose art depicting beautiful scenery I fell in love with during my travels, sometimes memorable experiences like of a gondola in Venice, and sometimes of architecture I loved like castles in Europe or a street in a favorite town or a charming hotel where my husband and I spent an anniversary. They are all unique, but they each hold special memories that I love to hold onto and treasure. I think it is part of my naturally romantic view of life, I want to hold on to beautiful places and memories as long as I can! Having these memories framed on my walls or sitting on bookshelves or window sills makes me smile (at least inside!) every time I pass by! I have very little art or decor in my home that isn’t directly related to a personal memory. Ever since my husband and I got married and bought our first travel art during an anniversary trip, I have collected memories to keep. Why would I invest in random art for my walls that ends up discarded when the next design fad comes along? 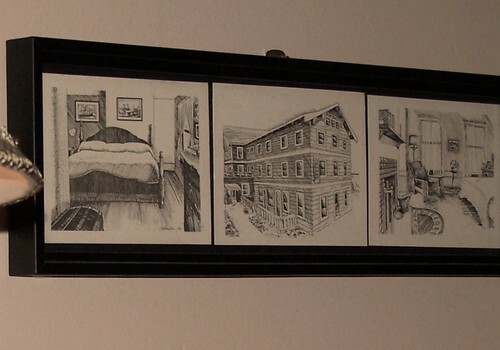 My art will always be right at home with me, whatever style of home I have. More important than the art itself is what it means to me! I love what it represents. Since I usually have very little money to spend, I almost always buy fairly inexpensive prints, or art directly from an artist on the street. It doesn’t have to be fancy! Sometimes I just buy hotel postcards or greeting cards (particularly line drawings), area maps, brochures, and now and then I bring home a book or some other piece that reminds me of a special place (for instance, I brought home The Orient Express book by Agatha Christie after a trip on the famous train!). In this house I haven’t yet put up all of my travel art since I wanted to paint my walls first. I am eagerly awaiting the day all of my travel memories are where I can see them! I wish I had it all out right now so I could show you more, but I guess that will save something fun for a future post. Unfortunately there are many places I have been that I didn’t bring home any art, so I am going to start finding it on ebay or ordering it online so I can enjoy more of those sweet memories. Even if you haven’t traveled far from home, you can use this same idea of travel art for preserving special memories close to home. I have line drawings and sketches I have bought from favorite cafes, old neighborhood movie theatres, favorite neighborhoods, houses I have lived in and a favorite flower from a local park. Simple memories are so much more powerful when they are in visual form! 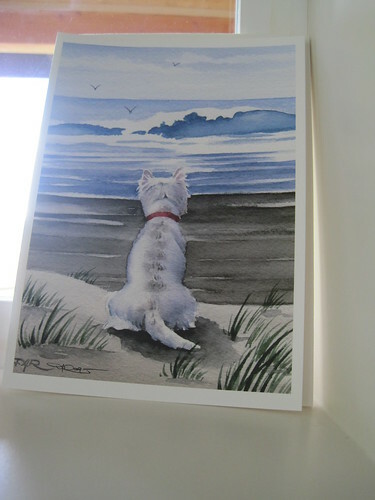 One of my water colors from a vacation is of a Westie at the beach, our 15 year old dog Winston has always LOVED our traditional family beach vacations so it makes a sweet memory! If you don’t happen to have anything else from your vacations, you could also enlarge and frame your vacation photos as a way of preserving those memories while decorating a wall. I have a little project in mind do just that! For more inspiration, check out my framed maps of places I’ve been! What do you like to bring home from travels? And, what has inspired you this week? Let’s link up our posts, shall we?! And be a pal, link back to this post if you include your linky! Want to see what I was inspired by? As in, my vacation post? Head on over here to see where I’ve been the past week and what it meant to me!